Cory Doctorow at Boing Boing led me to a great blog post by James Somers about the mellifluous language found in very old editions of the famous Webster’s dictionary. He cites how the default dictionaries on the Kindle and the most widely used online dictionaries are pedestrian and uninspired, even insipid. I consider my own prose to be straightforward and functional, albeit reflecting a vocabulary expanded by my avid reading. But I can certainly recognize the wonderful rhythm and style of Edward Gibbon’s prose in his History of the Decline and Fall of the Roman Empire, and see a similar attention to prose stylings in the definitions (the definitions, for goodness sake) Somers cites in a very old edition of Webster’s. pulchritude n. [mass noun] LITERARY beauty. <ORIGIN> late Middle English: from Laton pulchritudo, from pulcher, pulchr- ‘beautiful’. 1. That quality of appearance which pleases the eye; beauty; comeliness; grace; loveliness. “Piercing our heartes with thy pulchritude.” Court of Love. 2. Attractive moral excellence; moral beauty. “By the pulchritude of their souls make up what is wanting in the beauty of their bodies.” Ray. Oh my, that is much better. I suppose a madman would try to use the crème de la crème of English words and meanings over time, the Oxford English Dictionary (not to be confused with the utilitarian Oxford Dictionary of English; the fascinating origin of the true OED was wonderfully told by the incomparable Simon Winchester in The Professor and the Madman ). But that would be absurdly expensive and bulky in print or even on a screen. Oh no. 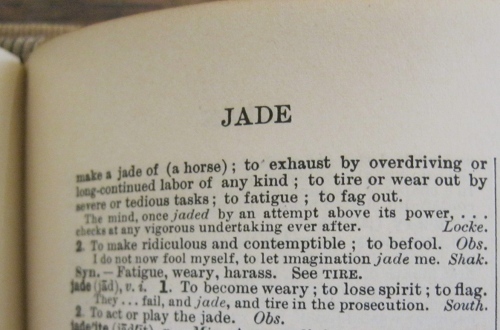 Webster’s 1913, please!